Simon & Schuster, 9781501196805, 272pp. For the millions of people in their fifties and sixties who find themselves out of work, unable to find a job, and financially incapable of retiring, here’s a practical plan for getting past any blame or shame, overcoming denial, and finding a path to a new normal. Elizabeth White has an impressive resume, which includes advanced degrees from Harvard and Johns Hopkins and a distinguished employment history. She started a business that failed and then tried to re-enter the work force in her mid-fifties, only to learn that there is little demand for workers her age, even with her outstanding resume. Her retirement savings account was largely depleted by her business. For a while Elizabeth lived in denial, but then had to begin to adjust to her new reality, shedding the gym membership, getting a roommate, forgoing restaurant meals, and so on. She soon learned she wasn’t alone: there are millions of Americans in her predicament and worse, exhausted trying to survive and overcome every day. Affirming and empowering, this book is a must-have for anyone whose income has suddenly diminished or even disappeared. With more than 100 online resources, it guides you through the emotional aspects of where you’ve landed and offers practical advice and options. If you’re ready to stop beating up on yourself and get serious about feeling good again, this book is for you. Elizabeth White is an author and aging solutions advocate for older adults facing uncertain work and financial insecurity. Most recently she served as Special Advisor to the Executive Director of Senior Service America. Before joining SSA, she was the Chief Operating Officer of a midsize non-profit focused on improving economic conditions in Africa. She is also an entrepreneur, having co-founded and led a chain of decorative home stores in Washington, DC, Philadelphia and New York. She began her career in international development at the World Bank. Ms. White earned an MBA from Harvard Business School, a Masters in International Studies from Johns Hopkins University, and a BS in Political Science from Oberlin College. A self-described “army brat,” she grew up in various countries in Europe and North Africa. She resides in Washington, DC with her daughter and grandson. She is the author of 55, Unemployed, and Faking Normal. "Providing practical solutions with a focus on retirement and maximizing savings, White maintains authority with a realistic, empathetic tone throughout. This deeply useful work will resonate with aging readers of all income levels and situations." "Generously guides a generation of Americans finding a healthy, sustainable new normal and better life in their golden years." 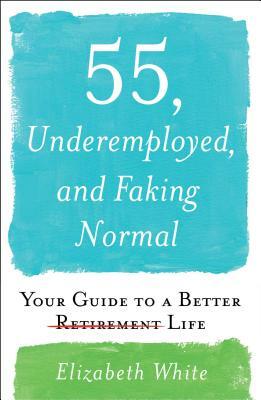 "55, Underemployed, and Faking Normal is required reading for all those who fear the finances of longer lives and a job market rife with age discrimination—in other words, everyone. Get a copy and breathe a bit easier: This book doubles as a lifesaving device!" "Elizabeth White's story is poignant and powerful. And, her new book is a fierce, insightful rallying call for both personal resilience and political action. 55, Underemployed, and Faking Normal is a tale of our age and our aging and it's one of my favorite books on the subject of midlife and beyond."